Calvados is the famous apple brandy of Normandy, and the bonnes femmes of Normandy often use the spirit to flavor their cooking. 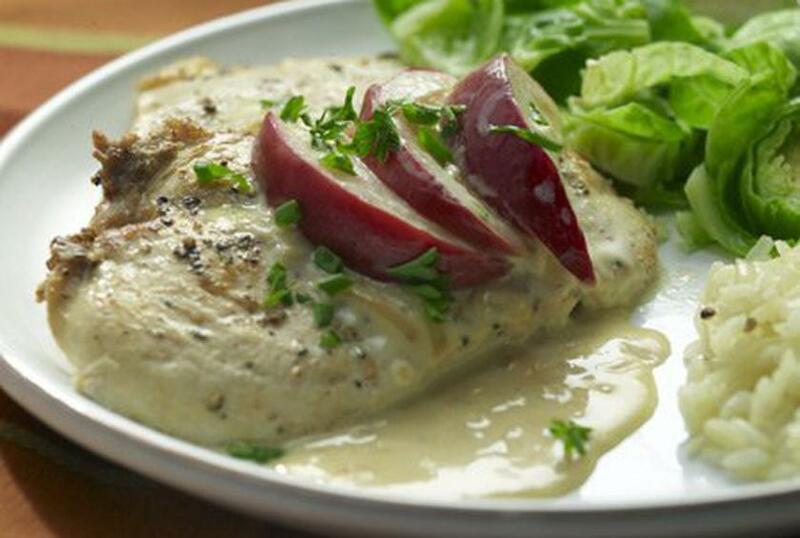 But don't feel like you have to buy a bottle of the real thing for this chicken breast recipe. If there's an apple brandy made in your region, reach for that over calvados. As for the apples, use the best locally grown apples you can find. After all, the more local your products, the more true-to-France your cooking will be. *Note: If you don't have calvados or apple brandy, you can also use ½ cup apple juice or cider and ½ cup white wine. Place the chicken breasts, 1 at a time, between 2 sheets of plastic wrap and pound to ¼-inch thickness. (You can also halve each breast horizontally or butterfly them.) Season both sides with salt and pepper, to taste. In a large skillet, melt the butter over medium-high heat. Add the chicken (in batches, if necessary) and cook, turning once, until no longer pink inside, 6-8 minutes (reduce the heat to medium if the meat browns too quickly). Transfer the chicken to a platter and cover with foil to keep warm. Stir in the shallot and sauté briefly until translucent. Remove the pan from heat and add the broth and calvados, taking care not to let the liquid spatter. Return the pan to the stove and bring to a boil over high heat, stirring with a wire whisk to loosen any browned bits from the bottom of the pan. Add the apples. Let the mixture boil until the liquid is reduced to ¼ cup, turning the apples occasionally — this should take about 4 minutes, depending on the stove and the pan size (it will take closer to 7 minutes if you substitute apple juice and wine for the calvados). Stir in ¼ cup cream and boil until the sauce thickens and the apples are crisp-tender. For a creamier sauce, add more cream, 1 tablespoon at a time, and continue to boil until the sauce thickens to the desired consistency. Season the sauce with additional salt and pepper, to taste. Arrange the chicken on 4 dinner plates, spoon the sauce and apples over the chicken, top with parsley and/or chives, and serve.